The Nokia 220 Dual SIM phone was launched at the MWC 2014 along with the Nokia X series, and is now available in India at Rs. 2749. The Nokia 220 features a 2.4 inch QVGA LCD display and sports a 2 MP camera. This feature phone supports expandable storage up to 32 GB via a microSD card, has Bluetooth and supports Micro USB charging. This dual-SIM phone allows users to take advantage of the pre-loaded Twitter and Facebook applications. Nokia proudly says that the new Nokia 220 has been built after seeing the success of the Nokia 110 budget phone. The Nokia 220 Dual SIM is packed with an 1100 mAh battery, which should deliver up to 15 hours of talktime and up to 24 days of standby time. This device measures 116.4 x 50.3 x 13.2 mm, while weighing 83.4 grams. 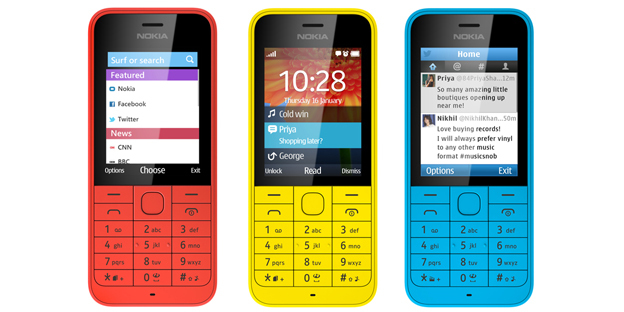 The Nokia 220 is available in five color variants; Black, Yellow, Red, White and Cyan. It seems that Nokia has no plans to launch the single SIM variant in India, which was also launched at MWC alongside this Dual SIM variant.